South Gloucestershire Council’s road safety education team have been visiting local schools this month with an exciting cycle safety presentation. 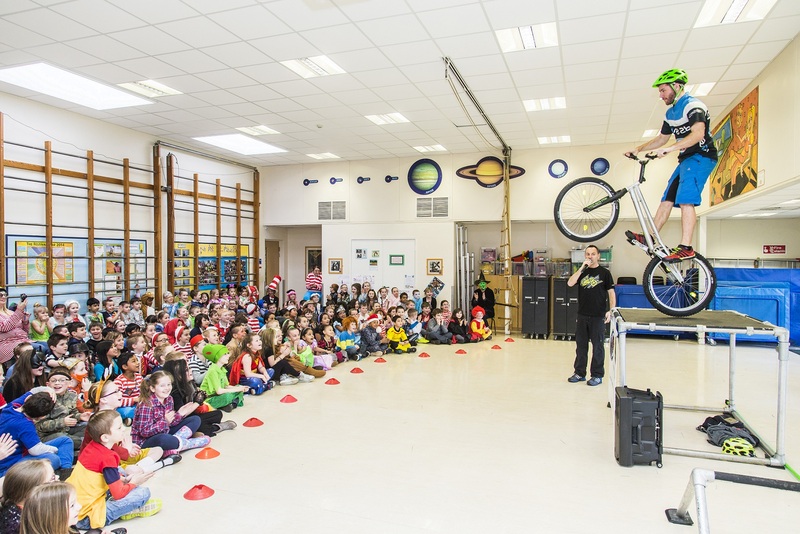 Working together with M.A.D, the UK’s number one mountain bike stunt display team, road safety officers visited a number of schools in South Gloucestershire between March 2 and 13 where talented mountain bike riders performed cycle safety demonstrations. The safety demonstrations were aimed at pupils in years 4 to 6, and featured the M.A.D team showcasing their stunt display skills before giving students an opportunity to ask questions and discuss road safety concerns. The team highlighted the importance of safety and wearing a helmet, and also talked about how much time they’ve spent training to achieve their skill level. This was followed by a commentary on why riding a bike is so good for you, focussing on the benefits and health aspects. Schools taking part included St Paul’s Catholic Primary, Meadowbrook Primary, Wheatfield Primary, Raysfield Junior, Pucklechurch Primary, Barley Close Primary, Beacon Rise Primary and Hanham Abbots Junior School. The safety presentations took place indoors and for some schools formed part of an assembly on cycling and road safety. The M.A.D team also encouraged students to sign up for free Bikeability cycle safety awareness courses. Bikeability courses improve students’ on-road riding abilities, and aim to make them more road aware. To get their Bikeability award, students are instructed on how to ride their bikes to the Government-approved National Standard for Cycle Training, which sets out the training and skills essential for making cycling trips on road. Courses are available during school time and also during the school holidays.